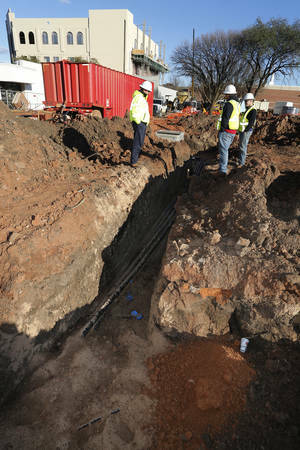 Twenty Miles of Underground Pipe in Oklahoma............ - Ground Loop Heating and Air Conditioning, Inc.
EDMOND — Property circling the city’s new public safety center at First Street and Littler Avenue will hide 20 miles of black PVC pipe that the project manager describes as looking like spaghetti running underground. “If we could see three-dimensionally into the ground, we would be scared, wouldn’t we?” said Wes Brannon, project manager for Frankfurt Short Bruza architects and engineers. The PVC pipe is part of a geothermal system where 101 wells will be used to heat and cool the new 70,000-square-foot public safety center instead of a typical heating and air conditioning system. The new home of police headquarters, the 911 communication center and emergency management operations is the third city-owned building to use a geothermal system. The Mitch Park YMCA and the Cross Timbers Public Service Center were the first two city buildings to use geothermal energy, which uses the earth’s relatively constant temperature to provide heating and cooling for residential and commercial buildings. In Edmond’s system, water is circulated through plastic pipes buried beneath the earth’s surface. During the winter, the fluid collects heat from the earth and carries it through the system and into the building. During the summer, the system reverses itself to cool the building by pulling heat from the building, carrying it through the system and placing it in the ground. The advantage of a geothermal system is it is cost-effective, reliable, sustainable and environmentally friendly, city leaders said. The public safety center geothermal system will cost $1.25 million. Brian Sauer, director of mechanical engineering for Frankfurt Short Bruza, said the public safety center will recoup the cost two or three times faster than most similar systems because the building will run 24 hours a day. The average building has a payoff in the five- to 10-year range. The system will save energy and reduce the city of Edmond’s electricity costs. Fisher estimates the geothermal system will save between 25 and 35 percent on electrical costs. He said he hasn’t calculated an exact dollar figure. About 72 percent of Edmond Electric’s budget goes to wholesale energy costs. The public safety center geothermal system has been a challenging project. Sauer estimated 50 architects and engineers at Frankfurt Short and Bruza played a role in the design of the two buildings that will make up the $28.6 million public safety center complex. A second structure, the former Edmond Electric building, is being renovated to give the police department the 15,000 square feet of space it needs for laboratory work and to store evidence. Voters approved in 2011 a half-cent sales tax to build the public safety center. Sauer said about 10 engineers worked on the mechanical design of the buildings. The spec book for the design of the public safety center is one of the largest composed by Frankfurt Short Bruza. Challenges and surprises surfaced while installing the well fields. In the former bank parking lot, workers found portions of a porch or basement that had to be removed and hauled off which turned out to be costly, said Deputy Police Chief Steve Thompson. City leaders speculated it could have been a house or a gas station from the 1950s or 1960s. The soil in that area had to be removed and new dirt brought in to protect the new pipes. The flexibility of the pipe underground in the sand also helps to protect the system from earthquakes, Brannon said. The public safety center is expected to be complete by July or August. This entry was posted on Tuesday, December 30th, 2014 at 6:25 pm. Both comments and pings are currently closed.